Though the actor wonderfully succeeds in impersonating popular types, the precise definition of his real "type" is to be found in his middle-class portrayals. 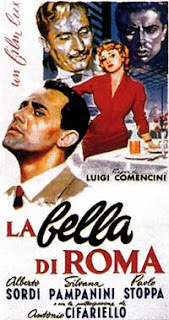 Already in 1955 in Comencini's BELLA DI ROMA (ROME BEAUTY), he was a tricky husband, a profligate to all appearances irreprehensible who parades his religious piety, an ambiguous figure endowed by Sordi with a highly subtle irony that corrodes it from within. Playing the charming swindler to the hilt, Sordi fits perfectly into one of the few examples of black humor in Italian-style comedy, Steno's PICCOLA POSTA (WANT-ADS: 1955), in the role of a phony count who runs a rest-home to which he entices little old ladies full of money to rob them or even, as in the case of Donna Virgina, to kill them off. In IL MORALISTA (THE MORALIST: 1959), directed by Giorgio Bianchi, he portrays, with ruthless sarcasm, a sort of professional moralist, the secretary of an international organization for public morals who turns out to be exactly the opposite: the organizer of a white-slave racket. Another perfect example of black humor is IL VEDOVO (THE WIDOWER), directed in 1959 by Dino Risi and written by Dino Verde, Sandro Continenza and Fabio Carpi, about a businessman on the verge of bunkruptcy who plans the perfect crime to get rid of his wife who has all the money. Between the malicious wife of Franca Valeri and the vile, shifty and hypocritical husband of Sordi, the film proceeds at a lively pace, keeping an eye on Anglo-Saxon models and aiming at an intelligent humor. Alberto Sordi frequently appeared in comedies based on married couples, suffice it to remember IL SEDUTTORE (THE SEDUCER) which in 1954 Franco Rossi (Florentine, born in 1919) successfully derived from the play by Diego Fabbri and which recounts the love affairs of an office clerk, who is caught and forgiven by his wife. The Fabbri play, behind the facade of a French-style vaudeville, aspired to simbolic meanings on the human condition which were lost in the film where nothing but the "divertissement" remains, but in any case the film was well-concocted and acted. Of greater depth was the leading character in LO SCAPOLO (THE BACHELOR), directed in 1956 by Antonio Pietrangeli (1919-1968) with the accuracy of psychological and environmental description that was characteristic of his work. Sordi is a man around thirty, Paolo, who all of a sudden decides to get married and looks around to find the ideal woman. The humor of the film lies in the process of choosing a future wife as if he were out to buy a house or company shares. A quite successful attempt at assailing the conventions and hypocrisies of certain bourgeoise marriages is to be found in IL MARITO (THE HUSBAND), directed in 1958 by Nanni Loy and Gianni Puccini (1914-1968) and written by the directors with Sonego, Sordi, Maccari and Scola. It is the story of a building contractor oppressed by his wife and mother-in-law as well as his sister-in-law, who, on the verge of bankruptcy, turns to a rich widow to borrow money, creating pandemonioum in the family.